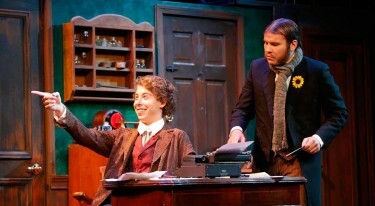 GCU students Ryan Usher (left) and William Wyss portray Sherlock Holmes and Dr. Watson, respectively, in first Ethington Theatre Series production of the year, “Sherlock Holmes: The Final Adventure.” It opens on Friday, with six performances over the next two weekends. What’s not to like about “Sherlock Holmes: The Final Adventure,” which this weekend kicks off the 2014-15 Ethington Theatre Series at Grand Canyon University? 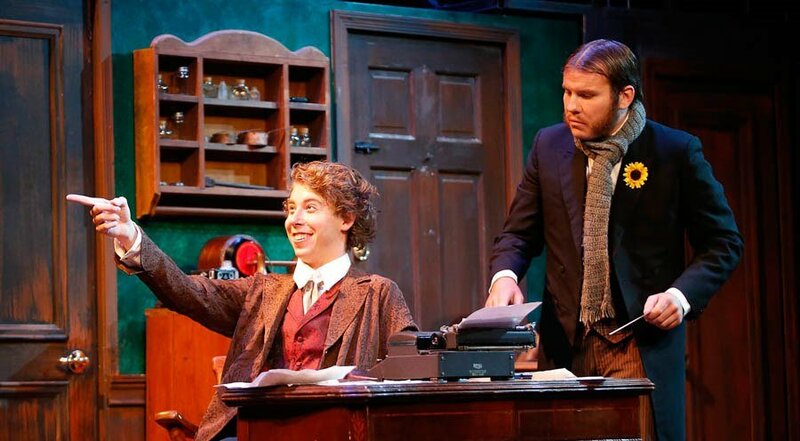 The supercilious British accents, the tortuous twists and turns, and the camaraderie between the smarter-than-thou Sherlock Holmes and his sounding board Dr. Watson make playwright Steven Dietz’s play a jolly good time. But a closer examination through the looking glass reveals a hidden gem in Dietz’s Edgar Award-winning adaptation of Sir Arthur Conan Doyle’s original story. For a mystery, its lead character has more in common with Batman than you might think. GCU students Kit Boyett, as James Larabee, and Joy Flatz, as Irene Adler, add to the hilarity and drama in this adaptation of Sir Arthur Conan Doyle’s original story. “Sherlock Holmes: The Final Adventure,” which Pensis describes as a “fast romp through deductive reasoning,” is a clever choice for Ethington and its audience. (And a popular one, apparently: The first two productions, on Friday and Saturday, are sold out, and only a smattering of tickets remain for the other four performances on Sunday and next weekend.) It follows on the heels of the BBC’s prodigiously popular “Sherlock” and the blockbuster films (2009, 2011 and a third in production) with Robert Downey Jr. and Jude Law. Junior Ryan Usher, one of two theatre students cast as Holmes, grew up reading Doyle’s books but has been less enamored with Guy Ritchie’s films. They display “too much action and too little of Sherlock’s genius,” he said. Usher relishes playing Holmes, who in Dietz’s story hasn’t pursued a case in years and is bored to tears, as someone who is having the time of his life with this new caper, strutting his stuff and saying whatever comes to mind. And oh, that mind. Pensis’ choice for the other Holmes, junior Aaron Potter, has prepared for his performance by studying how Basil Rathbone interpreted the role in his films of the late 1930s and 1940s. 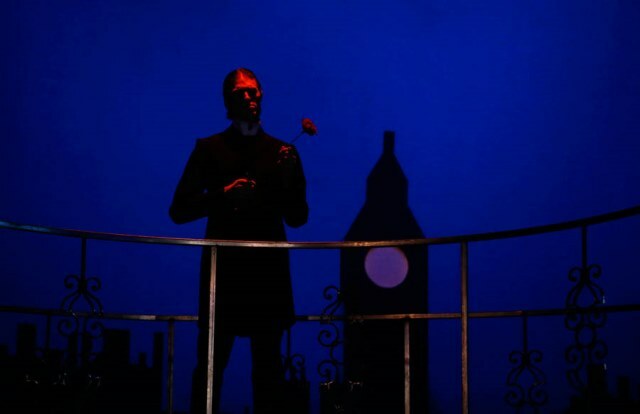 Booo, hisss: GCU student Keach J. Siriani-Madden plays the evil Professor Moriarity in Cast B of “Sherlock Holmes: The Final Adventure.” A second cast was formed to give more students the opportunity to be involved. Being double cast as Watson gave sophomore Dylan Kim a reason to dive into Doyle’s tomes and senior William Wyss permission to do so. Cast members are learning for the first time a British dialect under the coaching of GCU theatre instructor Michael Kary. Before a recent rehearsal, they stood in a circle on stage and appeared to be enjoying practicing their accents and speaking gibberish to get their lips and voices warmed up. “It’s like a whole new language for all of us,” Wyss said. To enable more students to hone their acting skills and be involved in the production, Pensis double-cast seven of the 11 characters/ensembles. Kim said sharing a role can be intimidating and cause competition, but he and Wyss are interpreting Watson so differently that the inevitable comparisons may not be forthcoming. For Usher and Potter, who are close friends and roommates, this is the second time they have been paired in a role (Richard Miller in “Ah, Wilderness,” October 2013). One thing’s for sure: They won’t be sharing Holmes costumes: Potter is 5 feet 10 inches, while Usher is 6-foot-7. Performances of “Sherlock Holmes: The Final Adventure,” on Friday and Saturday, Aug. 29-30, and Friday, Sept. 5, are sold out. A limited number of tickets are available for shows at 2 p.m. Sunday, Aug. 31, 7:30 p.m. Saturday, Sept. 6, and 2 p.m. Sunday, Sept. 7. Tickets, $5-12, and more information are available here or by calling 602-639-8880.